Coworking spaces are all about surrounding yourself with like-minded people. But that doesn’t mean you actually have to be working to hold an event at the PatchWork Collective. 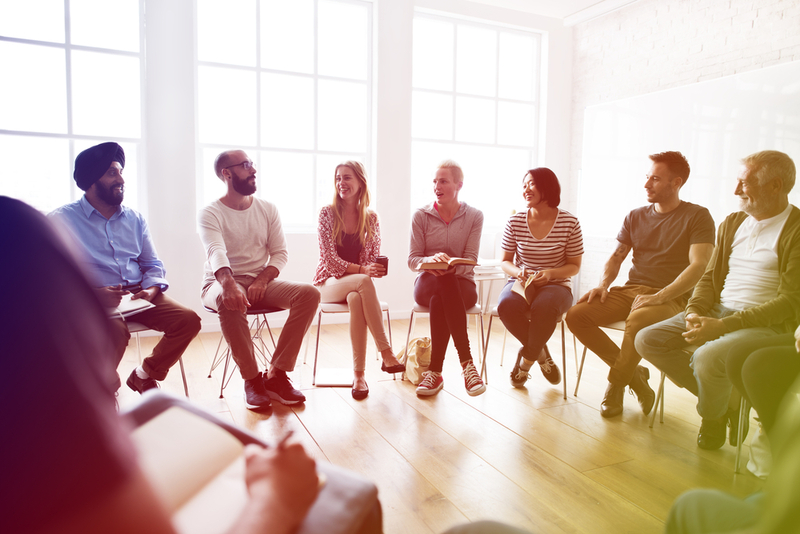 We offer club and group meeting space for everything from meditation to business networking. Book your space today. Today, more than every, people are filling their social calendars with club meetings and group events. Young professionals and active adults alike are finding ways to stay connected with friends through social gatherings. This is often especially true for young professionals, contract workers, and freelancers. Many of these workers have chosen careers that give them the flexibility to pursue passions and hobbies without being tied down to the 9-5. But unlike in years past, many of those clubs and groups are meeting outside the home. Dinner parties are still popular, but if you are trying to get to know somebody new, or want to invite strangers to join you, you probably don’t want everyone knowing where you live. Looking for a place for your group meeting can be a tricky balance. You want someplace public and easy to find. You could choose a restaurant, but that can bring with it an obligation to order food and the expectation that you’ll clear the table after an hour or two. Bars can be dark, loud, and crowded. What you need is a private room where you can get together and meet. In addition to renting spaces to local groups and clubs, we also host events of our own. The PatchWork Creativity Group meets twice per month. The first Thursday is an open creativity time where you can set aside time to work on your art or craft, bring your work in progress, and get constructive feedback from other participants. The event is free for members and $20 for non-members. You can RSVP to the next Creativity Group Meeting Thursday, November 1, 2018 at 5:30 or get more details by visiting the Facebook event. On the third Thursday of each month, we bring in a crafter to teach you a new hobby or skill. The cost of attending will vary depending on the materials provided for your new hobby. The next Creativity Workshop is Blogging 101 this Thursday, October 18, 2018 at 5:30 p.m. Guests will be guided through setting up a blog, choosing a target audience, and coming up with topics. The Metro Detroit Freelances Network is housed here at the PatchWork Collective. The group hosts twice-monthly networking meetings that are currently free to the public. Membership in the MDFN is available, and provides additional benefits, but you don’t need to be a member to come mett the members. The MDFN networking meetings provide freelancers, contract employees, and other participants in the gig economy a chance to connect and share referrals. The first meeting of the MDFN is today, Tuesday October 16, 2018 at 6:00.You can RSVP or get more details by visiting the Facebook event. The PatchWork Collective in Ferndale, Michigan has all that and more. We have a variety of rooms that can be arranged to suit your group meeting needs. We can host any size group from 3 to 100. And you can schedule your event on nights or weekends so you can do what makes sense for your members. Contact us now to schedule a tour and find a space for your next group meeting. Posted on October 16, 2018October 16, 2018	/ 0	/ Tags	clubs, coworking, group meeting, groups, PatchWork Collective, social event	Categories	Why Coworking?